The holiday season is almost upon us and that means lots of posts on the perfect holiday beauty gifts! This one comes courtesy of Make Up For Ever, Rock For Ever. While you can choose from 3 different rocking gifts, my favorite is the mini Aqua Eyes collection ($36.00). Housed in a snazzy rock n roll inspired box, you get 5 mini waterproof eyeliner in matte black, silver, gold, copper and dark grey. All of the colors are so wearable and they are the perfect size to fit in your night time clutch! 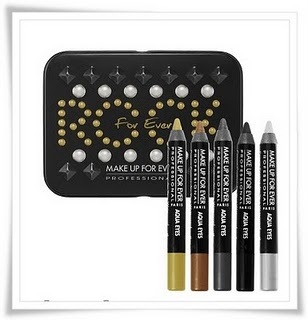 Other gifts include the Rock For Ever Eye Shadow Palette with 4 full-sized shadows in beige shimmer, black shimmer, white shimmer and silver iridescent ($45.00). You can also splurge on Creator and Artistic Director Danny Sanz’s 29 all-time favorite products ($299.00). Set includes everything from HD Microfinish Powder (a fave) to Faux Lashes. It comes in a fab rocker makeup case complete with studs! Unleash your inner rock star…. available November 1, 2010.